With the expansion of its own Division Mineral Processing, AUMUND Fördertechnik has laid the foundations to market conveyors and bucket elevators for the transport of bulk materials in industries beyond cement successfully. The company acts for the cement industry partially as a market leader worldwide. This year, AUMUND will deliver a bucket elevator to the Antwerpen plant of EuroChem (BASF) for the transport of ammonium Sulphate. The substance to be used as fertilizer amongst other is a byproduct of the production of plastic. In this plant, the AUMUND belt bucket elevator with a bucket width of 1,250 millimetres and an axis-centre distance of 42 metres replaces a still existing bucket elevator. The challenge for the planners of AUMUND and EuroChem is not only to exchange the existing bucket elevator but to install a machine within the existing building, that about doubles the capacity of the existing bucket elevator to a performance of 800tph (tonnes per hour). By the end of 2014, the old bucket elevator — a low speed device with middle extraction — will be replaced by a high speed AUMUND belt bucket elevator. 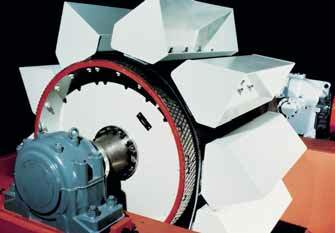 Besides the bucket elevator, AUMUND will provide a distribution chute and several connective chutes. Due to the corrosive atmosphere at the plant, the bucket elevator will be built completely of stainless steel. Plastic sheet will be employed as wear protection. The AUMUND Group is active worldwide. The conveying and storage specialists has special expertise at its disposal when dealing with bulk materials. With their high degree of individuality, both its technically sophisticated as well as innovative products have contributed to the AUMUND Group today being a market leader in many areas of conveying and storage technology. The manufacturing companies AUMUND Fördertechnik GmbH (Rheinberg, Germany), SCHADE Lagertechnik GmbH (Gelsenkirchen, Germany), SAMSON Materials Handling Ltd. (Ely, England), as well as AUMUND Logistic GmbH (Rheinberg, Germany) are consolidated under the umbrella of the AUMUND Group. In conjunction with the headquarters of the manufacturing companies, the global conveying and storage technology business is spearheaded through a total of eight locations in Asia, Europe, North and South America.